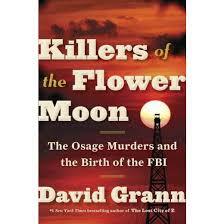 I have written before about Killers of the Flower Moon, the book by David Grann about crimes, including hundreds of murders, of Osage Indians in Oklahoma. The Osage had been repeatedly forced off their land, finally ending on up "worthless" land in Oklahoma. However, the land turned out to be on top of a huge oil field that for a time made the Osage one of the wealthiest people in the world. I finished the book last week. Not only is it well written and researched but the story is just incredible. But maybe not as incredible to me as to others. Bad people have not gone away, they just find new victims. To mask thy monstrous visage? Seek none, conspiracy. Hide it in smiles and affability. The money was systematically extracted in as many ways as possible. With the Osage, it was often by marrying into an Osage family, inflating prices, fraud, insurance scams and murder. With the divorce industry it is through dishonest marriage, inflated prices and billable hours, extra services, dragging on negotiations, fraud and driving people to suicide. The criminals maintained respectability. They were the leading figures in society and included lawyers, prosecutors, and judges. Widespread conspiracy was standard operating procedure in both cases. Both men and women committed the crimes. It is quite dis-heartrending that such evil not only exists in our society but openly and proudly exists.